This article was originally published in issue 106 of the S7 Newsletter. You need pretty basic software for drawing for these two processes. A number of people use QCad which can be downloaded free but my preference after many years use is TurboCad deluxe. At the time of writing (December, 2016) Maplins are currently selling version 18 (the one I usually use despite having a later version) for £7.99 so it really isn’t going to be expensive to experiment. I won’t give a detailed discourse here on how to use any particular piece of software but instead look at the elements you need to understand to make your drawing. I have, however, written a blow by blow account of how to draw the tender chassis side shown below using both TurboCAD and QCAD. You can download these from the top of section 3 of the 'Members Download' section of this website. (you need to be logged in to this site to access these). Most of the shapes we are likely to come across in railway or architectural drawings will require relatively few drawing elements. I suggest that you start by familiarising how each of these items can be drawn in your chosen CAD software: line, circle, arc, & polygon. Turbocad has a double line tool which is useful for drawing tabs quickly. It should be possible to draw each of these by entering the co-ordinates in a parameter box – it is really not possible to draw anything accurately for our purposes by simply using the mouse. 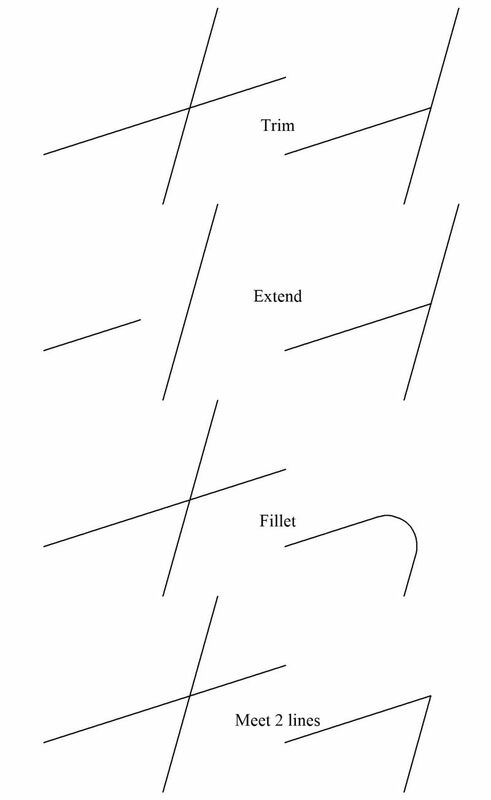 Fillet – makes a round corner between two lines or arcs. Objects and groups of objects can be copied in either a straight or circular array. You can specify how many copies you require and their spacing. Very useful when drawing compartment coach sides! You can also make a mirrored copy of an object or group of objects. Useful when drawing brake 3rds etc, but beware that the doors do not mirror so you need to correct the hinge and door handle holes (yes, I have made that rather expensive mistake). Almost all the elements mentioned above will be needed to draw the tender chassis in the sketch. Drawing programs use layers. Understanding layers is important as they are fundamental to how drawings for both laser cutting and etching are built up. Think of these as like drawing on transparent sheets and then putting all the sheets together. The ‘first cut’ layer. This is for through cuts which are internal. Imagine a carriage side. You would want to cut the windows out first before the final profile of the side since the material will no longer be held firm once that final cut is made. The final cut which cuts the item out of the sheet material. Some people create tabs, as in etching, but for your own work this is not really necessary. It may be helpful if you are sending your drawing to a commercial laser cutter as it will keep all the parts of your project together. The laser’s path has a tangible width, often referred to as the kerf. I use 0.2mm as the dimension to allow for. For large architectural pieces this is probably irrelevant, but if you are cutting something small like a window frame with window bars, then you should take it into account by moving the lines 0.1mm so that the material that remains after the cut will be the dimension intended. If a window bar is only 0.75” wide (which scales to 0.44mm, then and extra 0.1mm on either side makes a lot of difference to the result. Laser cutters can engrave as well as cut through. This is achieved by turning down the power of the laser. The depth of the engraving can be controlled by the power setting. I suggest you carry the engrave line past the edge of the resultant part if the line goes to the edge. I have found that you get a noticeably deeper cut near the ends of an engrave line as the laser head is accelerating at that point and therefore the laser is burning for longer. This is not always possible but it’s worth it if you can. In the etching process there will be two phototools produced, one for the front surface of the metal and one for the back. In areas where the metal is to be etched away completely, the drawing elements will be the same on both phototools. Areas where the material is to be half etched will only appear on the front or back phototool. The construction lines. These are the outlines to all the areas that need to be etched. The “through” layer, where all the metal is to be removed. By convention the fill is coloured black. The “front” layer, where the metal is half etched from the front. Fill colour: red. The “back” layer where the metal is half etched from the back. Fill colour: blue. I add a 5th layer for the tabs to help the etcher which I fill in green. This will be used exactly the same way as the front layer. Most people just use the front layer for tabs. The etcher will combine layers 2 (through) and 3 (front), (and 5 if you have used it) to make the front tool and 2 & 4 (back) for the back tool. Note that you can choose to make any layer invisible. This is useful for checking. There are often references to the undercut in etching. This is where the acid will eat away the metal a small distance inside the edge of the phototool mask. PPD, who I use for my etching, suggest that the undercut is 15% of the metal thickness. If you are drawing for a fret on 0.4mm (16 thou) thick metal, the undercut is 0.06mm. I doubt whether it is worth allowing for this especially if you are measuring dimensions from a drawing. Doing your own CAD work allows you to create models not otherwise available from the trade and perhaps impossible to achieve by scratchbuilding. 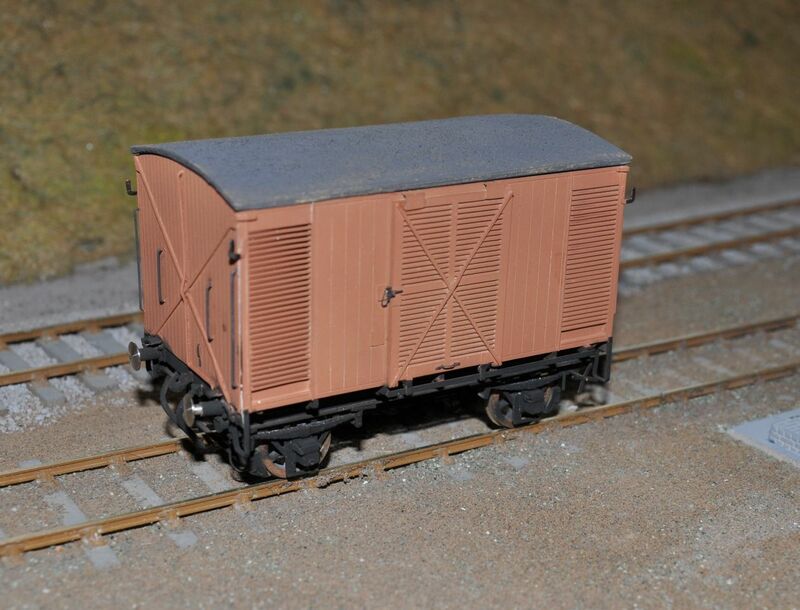 A few years ago, Waratah Models in Australia produced a limited run of the New South Wales Railways CPH railcar, affectionately known as Tin Hares. They lasted from 1923 to the mid 1980s. In country areas, where their luggage capacity was inadequate, they were often paired with specially built lightweight 4 ton louvred vans. I quite fancied one of these and the van shown was produced from my own etches and patterns. I hope these notes will help in understanding the 2D CAD process as it is applied in our hobby. I will try to expand on the detailed exercises available on the website over the coming months, and I look forward to seeing the tangible results of your efforts in future editions of the Newsletter.